Meet Hayley, runner, nutrition nerd and community connector in Calgary, Alberta. Hayley loves supporting the Calgary run scene as a pace crew leader for YYCRunCrew and enjoys working with children as a pediatric dietitian. Growing up in a family of runners Hayley was frequently exposed to running, however being a soccer player for 22 years meant running always took a backseat. A shift happened in 2013 when Hayley ran her first half marathon and over the next five years she would complete many more (setting a new personal best every year) and realize the huge impact of being a part of an incredibly supportive run community. [personal] qualify for the Boston Marathon! First Hayley will be tackling the Phoenix Marathon in February [with an inspiring group from YYCRunCrew], followed by the BMO Vancouver Marathon in May as her first time being a RUNVAN® Ambassador! Hayley’s thoughts: What better way to achieve your run aspirations than alongside a team of goal crushing runners? 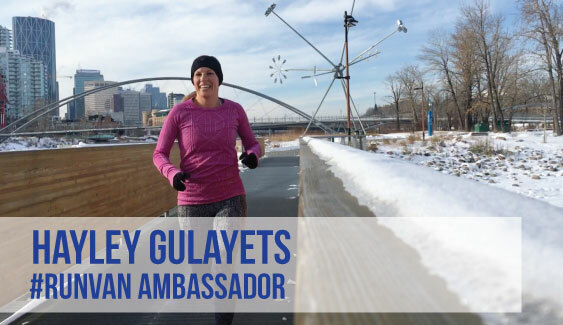 You can follow Hayley’s run adventures online – instagram: @haylsg17, Strava: Hayley Gulayets, and at YYCRunCrew (yycruncrew.com, instagram: @YYCRunCrew, facebook: YYCRunCrew). Take us back to the first time you ran your first race. What was it like? How long ago was it? What do you think has changed since then in the Vancouver running scene? Although I ran 5k races with my family growing up, I would say my first big race was the Seawheeze half marathon in August 2013. I unfortunately suffered an ankle injury playing soccer just 6 weeks before the race, and without ever having run longer than 10k [note: this is not recommended!] I managed to complete my first half. The excitement and the rush of crossing the finish line while being surrounded by an incredible community of runners and supporters absolutely ignited me. My passion for running spurred from there and thankfully the weeks of soreness were largely outweighed by the fun of the race! Name a few of your favourite places to run in Vancouver or your city. Why do they stand out for you? Favourite in Vancouver: The Seawall, the bliss of being along the coast while breathing the salty air is such an amazing feeling – nowhere to be, cruising along and enjoying the scenery. Favourite in Calgary: hands down by the river – especially on the Southside in summer away from the noise of the city and traffic. I am fortunate to live 3 blocks from the Bow River pathway and knowing I can lace up, head out and be river side in minutes is incredible. I find being outside and often connecting with friends over a run by the river allows me to step away from the chaos of my day-to-day and enjoy the moment. Running is a great way to see the world. Of all the places you’ve traveled to outside of Vancouver or your city, whether it be for competition or for pleasure, which was your favourite spot to run in and why? Surprise [haha] – one of my all time favourite running spots was along the coast when I lived in Australia, particularly returning to my birthplace of Adelaide and completing an 8k Resolution Run. I seem to be drawn to running waterside, there is something blissful about running while hearing the laps of the ocean or babbling of a river. Gets me every time. Running along the beach always made me feel an immense sense of gratitude for being so small in a huge world that we are lucky enough to have the opportunity to explore. It’s a pretty unique feeling – I highly recommend it! I find it helps with pre-race jitters to be organized the night before – this way, if anything comes up race morning it feels less chaotic [insert memory of when my shoe lace broke right before walking out the door! haha]. I lay out my outfit (attach my bib or time sensor), socks, shoes, nutrition, and anti-blister/anti-chaffing supplies so when I wake in the morning I can hydrate, eat, gear up, relax and roll-out. In the corrals before the race I like to chat with those around me, see what brings people out and meet some new friends! I find this also helps with any nerves as it takes my mind off the race. When it’s go time: I inhale, exhale, start my GPS and remind myself to have fun while soaking in the experience! Pay it forward: What’s the best advice you’ve ever received from a parent, coach, or mentor about running? OR got your own advice? Share it with us! At the end of the day, do what you love and love what you do! It might sound cliché, however, I believe this in all aspects of life – especially running. When your foot hits the ground whether for a race or an everyday run – enjoy it, take it all in. There are going to be tough days and amazing days, they’re all part of our journey. I often remind others: it’s not how fast you run, or how many races you’ve done – it’s the sensation of doing something you love, seeing how far you can push yourself and [hopefully] doing it alongside other awesome people!